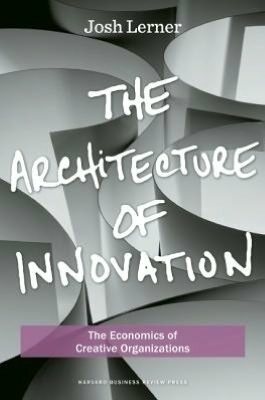 Harvard’s Josh Lerner has written a new book, The Architecture of Innovation. It is basically an up-to-date recount of what we know about how innovation is encouraged. It is heavily research based but extremely accessible and is a must read for anyone interested in the economics of innovation. The basic thesis of the books is: monetary incentives matter — they matter especially for people putting up capital — venture capital has done great things but only in a few targeted industries but we don’t really understand why — corporate venturing has lots of promise but has been considered out of vogue — but if we could make corporate venturing work alongside venture capital perhaps with more sub-industry specific funds things would be better. That is pretty much it. A sound, well-argued treatment; a solid, theoretically grounded, empirically backed up story. It is not one of those management books designed to point you to a ‘new way.’ It doesn’t make up or even utilise new catchwords — a simple searched indicated that the words “disrupted” or “disruption” turned up only 5 times in the entire book which must be some sort of record for a post-1996 book on innovation! It is just authoritative and informative while still being an interesting read with experience and historical stories where relevant. Refreshing.